Edward Hopper (1882 – 1967) is considered by many as the painter with the cinematic eye. Born and raised in a bourgeois New York neighborhood, the painter took an early interest in depicting American Life. Starting with early black and white etchings and finishing with paintings that took a prominent place in American culture, the realism of Edward Hopper has been a source of influence in different arts, particularly film. And this close relationship with film as a source of inspiration became mutual because the film industry showed signs as early as the 1940s that it also profited from Hopper’s paintings. A great range of films were and continue to be influenced by the painter’s use of light – the contrast between light and shadow, highlighting forms, figures and textures; by the settings of his paintings whether they were rural – like houses along New England or Lighthouses by the sea – or set in cities – skylines, rooftops, middle class apartments, diners and bars; by his framing – decentralized; and specifically by the figures he painted, people, often lonely or estranged from society – the last costumers of a bar, clerks working in night offices, couples enjoying their evening after supper, women waiting, for someone, or for the start of the next picture. They were ready-mades situations, close depictions of the American Way of Life, waiting for their stories to be told, their apartments to be filmed, the causes for their loneliness to be documented and the causes for their detachment to be explored. This was the role film assumed, bringing life to those portraits, mimicking its techniques and settings, drawing inspiration from them or using them to depict people and places that belong to a certain time in History. This is a list of twenty film titles among many, chronologically ordered, that assume a close relationship with the painting of Edward Hopper. Alfred Hitchcock moved to America in 1939 after a celebrated contract with David O. Selznick. In the US, he would shoot some of his most known classics and deepen the relationship his cinema had with the realism of Edward Hopper. Shadow of a Doubt is one of those classics that are highly influenced by the works of Edward Hopper, it follows the suspicions a teenage girl, Charlie, has over the mysterious presence of her newly arrived uncle, Charlie. In this film, not only the chosen locations are similar to some of the locations the painter illustrated in his works such as the Hodgkin’s House (1928) or Room for Tourists (1945), but also the use of windows, doors and the placement of characters within a given space remind of other ‘Hopperian’ works like Summertime (1943). Something undeniable is the inspiration noir film took from Hopper’s paintings and vice versa. 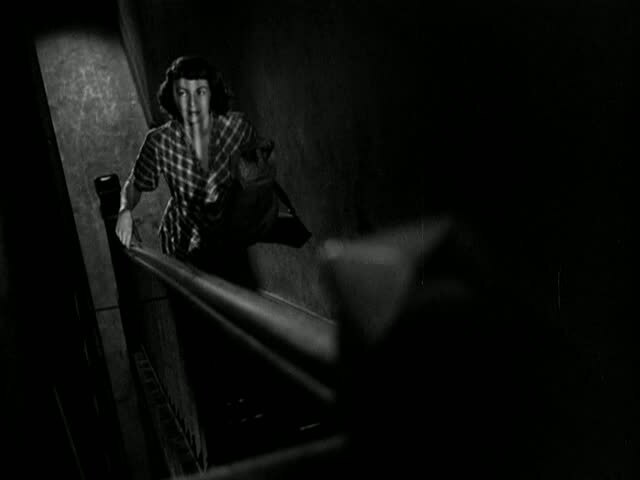 Thus, in many noir films like Scarlet Street is possible to recognize traces of the painter’s influence. 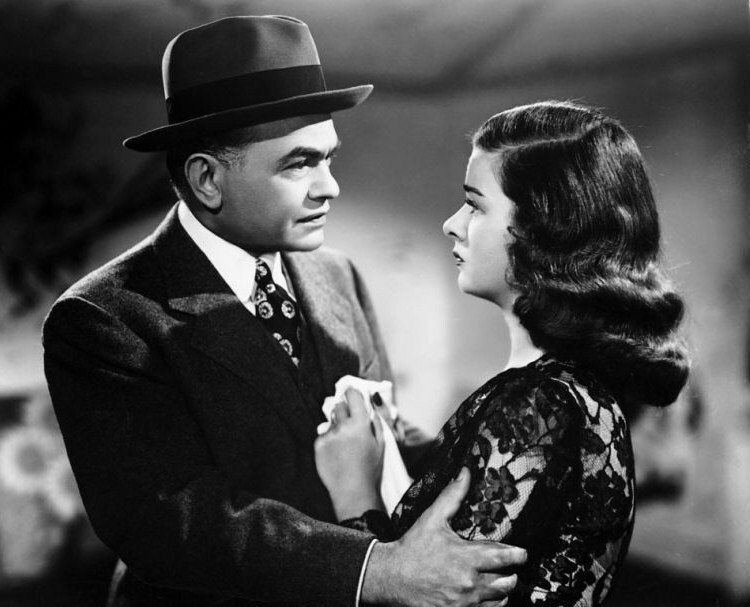 Scarlet Street a tale about a man going through a mid-life crisis, Chris, who befriends a mysterious young woman, Kitty, who is then convinced by her gangster boyfriend to fake her love for him in order to rob him his fortune – which he actually doesn’t have. 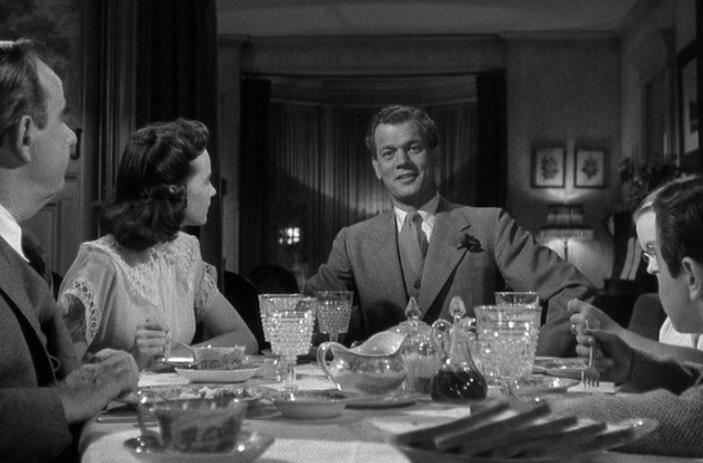 In this particular film (as well as in Fritz Lang’s Woman in the Window shot in 1944) the use of light, the suggested voyeurism, themes such as loneliness, depression and the shooting on locations such as underground bars or typical New York flats gives the nowadays viewer a glimpse of the 1940s America. The America painted by Hopper. Legend has it that after reading Ernest Hemingway’s The Killers, Edward Hopper was inspired to paint his magnum opus, Nighthawks in 1942. 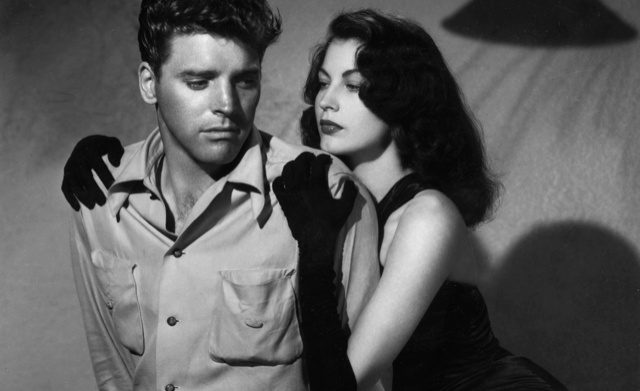 Upon watching The Killers, the 1946 Universal’s production, it’s irrefutable the connection between painting and film. The Killers revolves around the assassination of a man nick named ‘The Swede’ and his connections with the hitmen that murdered him, the underworld of organized crime and seductive yet deadly Kitty. 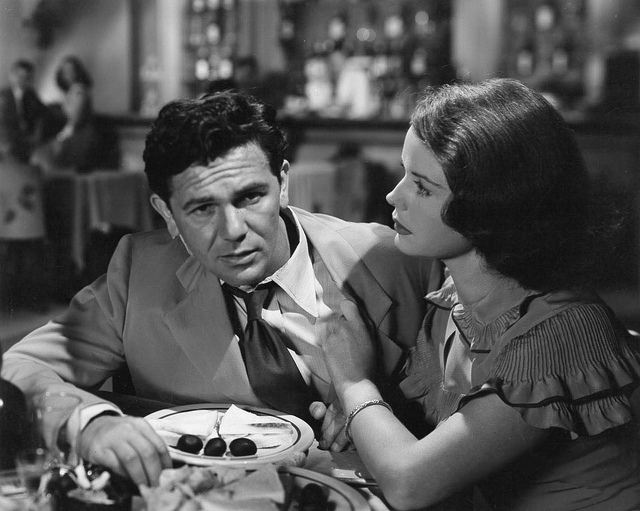 And in this film not only the place where the two hitmen meet resembles the bar in Nighthawks but particularly the use of light, with its contrasts between shadow and light highlighting textures of objects, specially the cigarette smoke (which became a symbol of film noir), was drawn, among other different sources, from Edward Hopper’s paintings. This 1948 RKO production features this list because it shares many of the reasons mentioned before – the use of light, the themes – but Force of Evil is different in a way that it portraits the pessimist view over America that the painter had. It gives a complete sense of Hopper’s New York – featuring the typical New York architecture, the Brooklyn bridge, lighthouses, as well as, the rocky coastal area. 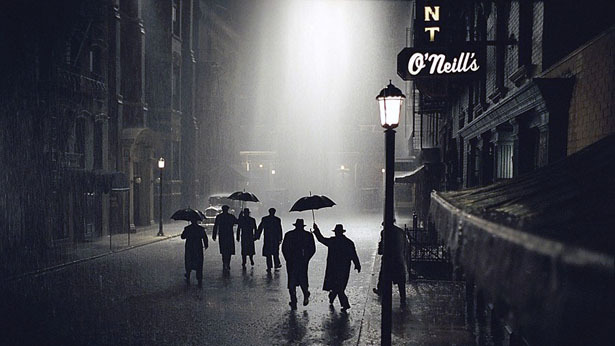 It is said that while shooting, the director took the cinematographer, George Barnes, to an exhibition of Edward Hopper’s works and said that he wanted the picture to look like those paintings. And it does. Force of Evil tells the story of a crooked lawyer, Joe, who drags his older honest brother, Leo, into a scheme controlled by a gangster client of his. “There are eight million stories in the Naked City” the narrator said and that sums one of the most important aspects of Hopper’s paintings, the views over people shut in their loneliness making the viewer wonder about their identity and the stories they conceal like the lonely woman in Automat (1927) or the people in Chop Suey (1929). 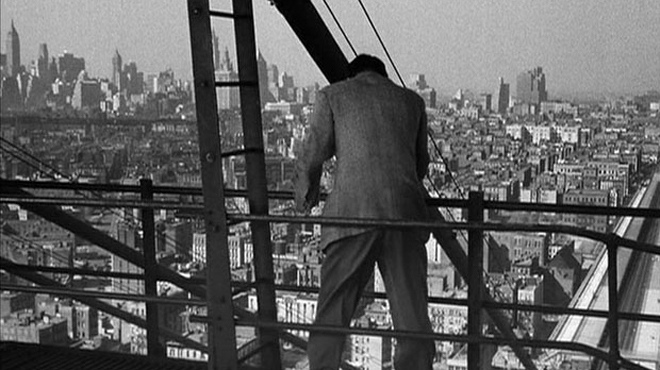 This film contemplates New York as Hopper painted it, real life hidden in the midst of ‘noirish’ lights. It concentrates on two detectives trying to straighten out the circumstances behind an attractive young woman’s death since they conclude she did not kill herself but was killed by somebody else. Set in a New York suburban neighborhood, this film follows a boy named Tommy who during a hot night climbs into his neighbor’s fire escape and ends up witnessing a murder. The problem is that Tommy lives fascinated by crime and heroic stories and due to that he has lied before to his parents and friends but now that he actually saw a real crime, no one seems to believe him. When watching this film one can actually imagine that it is one of the many paintings Hopper did of New York buildings and apartment complexes gaining life. In many scenes but particularly when Tommy is being chased around New York roofs and buildings under construction the similarities between The Window and some of Hopper’s paintings such as Skyline Near Washington Square (1925), Roofs, Washington Square (1926) or From Williamsburg Bridge (1928) is apparent.